Here’s a car from my childhood. It obviously has plenty of patina, but still runs and drives well. The important thing is that the camera on the new phone is a bit better. No flash, but I rarely used it anyway, and low light performance and white balance are much better. I actually do have access to a real camera, but that’s my wife’s thing, so I don’t usually want to bother with finding it, and then uploading pics. With Google Photos, I take the pics and they’re ready to copy into my post. Anyhoo, you’re here for the diecast, not details on a budget phone. I have no idea where or when I got this, I just know that I’ve had it for a while. 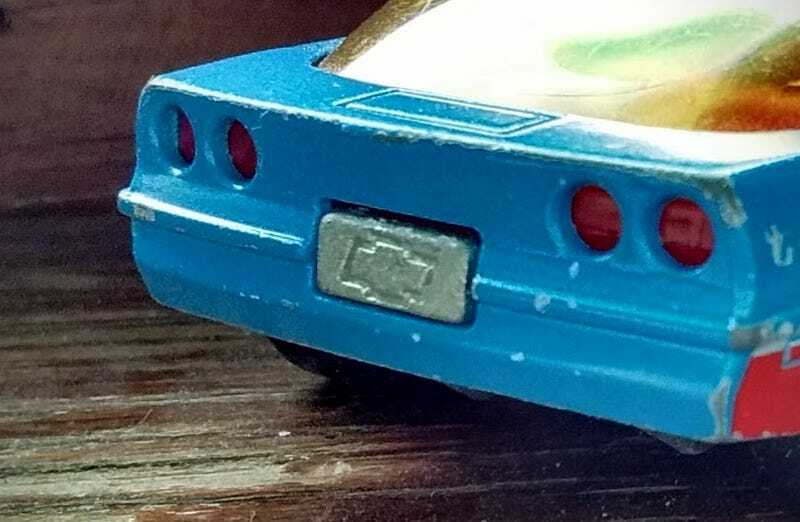 It’s a Majorette Corvette C4, claims to be 1:57 scale. I wasn’t bothered with scale when I was a kid, all I cared about was that it didn’t fit the orange track. In my mind, that was a bit of a minus, but also marked it as a cool car, because the other car in that category was the awesome MBX Lamborghini Countach that I had. The livery amuses me, since it’s clearly *almost* Richard Petty’s STP livery. Interestingly enough, TSP (Texas Speed & Performance) specializes is performance Chevy engines, so it’s kinda appropriate.